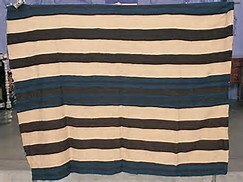 The Second Phase Navajo Chiefs Blanket has the addition of twelve boxes or rectangles laid down on a first phase chiefs blanket pattern. 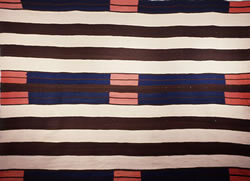 The second phase Navajo Chiefs blankets are the next transition in Navajo aesthetics. These blankets will bring somewhere between $125,000 to $250,000. Second Phase Blankets are also very rare but more common in comparison to the First Phase Blankets. The Third Phase Navajo Chiefs Blanket, for many collectors, may be the most artistic of the Chiefs Blankets. Composed of nine diamond or Cross formations, these blankets were made in the 1860 to 1880 time frame. The earlier or Classic Third Phase Chiefs Blankets are the most valuable. The Navajo or Dine (dih-NEH, the Navajo word for themselves, meaning “the people”) are an Athabascan people who migrated to the Southwest from western Canada sometime between 1300 and 1500 AD. After their arrival, a holy person named Spider Woman taught the Dine how to weave. Spider Man gave them instructions for building the looms. Accordingly, Dine men build the looms for their wives, daughters and mothers, but women traditionally do the weaving. Anthropologists believe that the Navajo learned to weave from their Pueblo Indian neighbors. Since about 800 AD, the Pueblo peoples had been weaving cotton originally brought from Mexico. The Navajo and Pueblo had extensive contact through friendly trading, but also through the raiding depredations and slave taking of the Navajo from surrounding tribes. Pueblo influence on the Navajo undoubtedly increased when the Spanish occupied Pueblo lands beginning in the late 1500s. Religious repression and harsh treatment at the hands of the Spanish drove many Pueblo families to escape deep into Navajo territory. By the mid-1600s, the Navajo were becoming skilled weavers. Prior to imparting their weaving knowledge to the Navajo, Pueblo weavers themselves had come under the influence of Spanish weavers. The most important and long-lasting change was the introduction of wool. Mark Rossi Churro Ram Churro sheep, not native to the Americas, had accompanied the earliest Spanish explorers and settlers in the Southwest. With its very long, wiry fibers, Churro wool was easy to spin and made very durable weavings. Although the Pueblo peoples continue to use cotton as well as wool to the present day (particularly for ceremonial garments) the Navajo whole-heartedly adopted wool and became a sheep-herding society. The Navajo’s use of cotton declined over the course of the eighteenth century, and only one early Navajo weaving in cotton is known to survive. Garments—especially wearing blankets—comprised most of the products of the early Navajo and Pueblo looms. 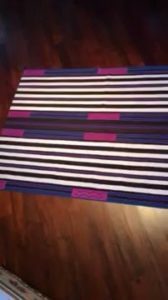 Traditional, Native-made blankets were wider than long (when the warp was held vertically) and were typically known as mantas. The Spanish introduced the longer than wide serape (or serape) form that was easier to make on European style looms. Mantas and serapes generally were used in the same way: wrapped around the shoulders with the long edges on the horizontal. However, mantas also were used by women as wrap-around dresses secured with a woven sash or belt. Navajo serapes only rarely had a slit in the middle for the head which made them ponchos. 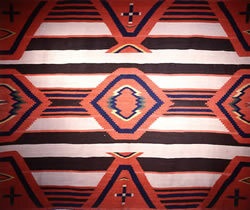 Navajo weavers made both the manta and serape styles during the eighteenth, and nineteenth centuries along with shirts, breechcloths, and belts. As we will see, the now-famous Navajo rug was an invention of the late nineteenth century. Scholars and collectors usually classify Navajo weaving into four overlapping periods defined by types of products, styles, and materials, although few scholars agree on the appropriate dates for each period. In any event the dates and periods should be understood only as a rough chronology allowing for many exceptions.